While the waves of wily Lake Superior can offer swimmers, kayakers and surfers a wild ride, it can also turn a good time into a dangerous situation in a hurry. Jamie Dolan and her daughter Tyler of Marquette were enjoying riding the waves recently when Lake Superior’s strong rip current started dragging them far from the beach at Presque Isle Park – a spot favored by surfers and kayakers for its waves and strong currents. Before they knew it, however, the two began feeling like they were “in quick sand,” as Tyler described it. Dolan remembered the techniques she learned in water rescue class – do not panic and tread water instead of trying to fight the current. But as the 5-foot to 7-foot waves rose above her and her daughter’s heads and they found themselves fighting for a breath nearly 100 yards from shore, she knew that they were in serious trouble. Fortunately, kayaker Bob Hendrickson of Negaunee noticed the dire situation and paddled toward Tyler. As he struggled to help her hang on to his kayak and get her to shore, surfer Mike Horton of Marquette, rushed to help Tyler’s mom, who was about 50 feet away. Using his board, he was able to get Dolan safely to shore; however, Tyler and Hendrickson continued to struggle. Horton returned to the water along with fellow surfer Dan Schetter to help Hendrickson rescue Tyler. Meanwhile, Hendrickson worked to keep Tyler above water. He said when he first reached her, he knew the situation was serious. Horton attached his surfboard ankle leash to Tyler’s wrist and all the rescuers worked to keep her head above water. With the three men’s efforts, along with two other unidentified surfers and kayakers, Tyler was brought to shore safely. Hendrickson said he was relieved. 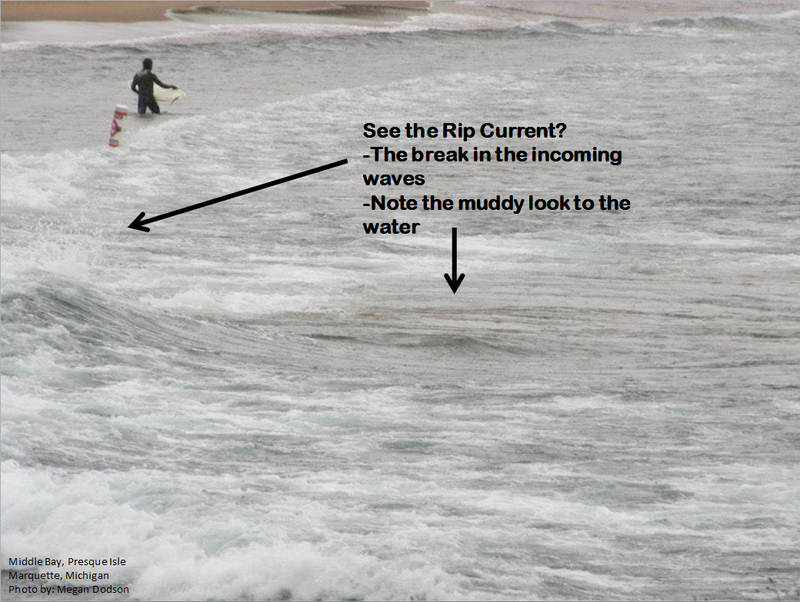 Hendrickson and Horton agreed that this incident is a perfect example of how Lake Superior’s rip currents can take swimmers by surprise in mere moments. Hendrickson said the current on that day was especially strong. “It was one of the strongest rip currents I’ve been in,” he said. Despite their harrowing experience, Dolan and Tyler plan to continue swimming in the lake they love. However, they plan on being more cautious.